Rikaikun (also known as Rikaichan on other platforms such as Firefox, Internet Explorer and Safari). This is an incredibly popular extension and is a must have for Japanese learners. With this extension activated, you can go to a page in Japanese and hover over any word and the reading and English meaning will be displayed in a handy pop up box. With this, tackling a website entirely in Japanese is a lot less scary! It is also worth noting that Rikaikun is pretty good at recognising the root of conjugated verbs as well as place names, which can sometimes be an issue with apps like this. This is useful when you need to practice the te form! Mainichi is a handy extension which will show you a new piece of vocabulary every time you open a new tab in Chrome. The word is shown in kanji, kana and romaji with a helpful pic – handy for reviewing or learning a new piece of vocabulary. You cannot choose the type of vocabulary that appears but I have found that there is a good mix between simpler and more complicated everyday vocabulary. Besides Japanese, there are also options for Korean and Mandarin Chinese if you are also learning those languages. Pocket is not specifically for language learning but I use it a lot for Japanese study. The Pocket app allows you to save a page for offline viewing later. The Chrome extension allows you to add new pages to read later with a click of a button and will sync with the app if you have this installed on another device. 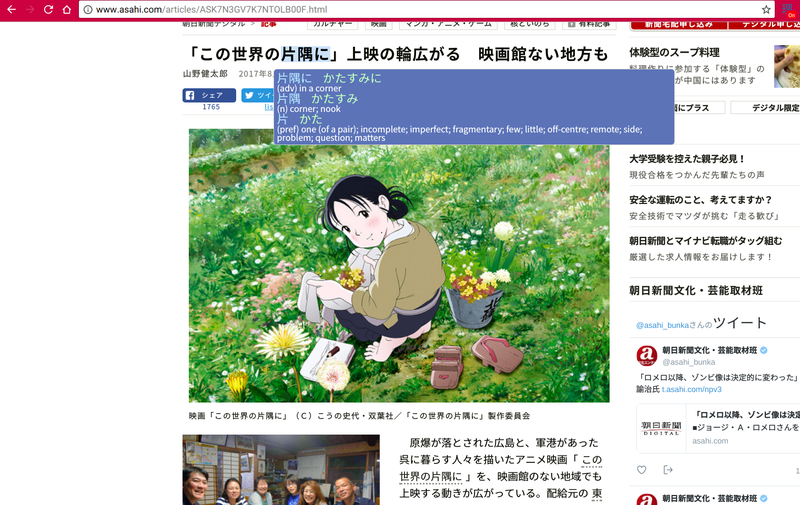 I find this useful for saving news stories online – together with Rikaikun, you can make short work of tricky articles. If you install the app on another device you can start reading on your laptop and carry on reading on your mobile. Are there any must have extensions (on Google Chrome or any other browser) that you cannot live without? Let me know in the comments. I didn’t know Rikaikun but I have installed it and it is fantastic! I use it to read the news in Japanese and it really saves time 😃　Thanks for the tip!